This article is about the miracle worker, for the letter in the form of electronic... lettering... postage service... mail, see homsar with a minuscule B.
Homsar, a character on Homestar Runner, has composed is a song from the 60's, the captain of the gravy train, a friendly reminder, winner of the Powerball and the democratically elected president of the United States of America. Son of a cup of coffee and a chipwich, he is the great-grand-pappy of Kevin Federline and contributed to several songs on K-Fed's upcoming album, Playing With Crap. He is also a trendy tote bag. [email protected]!. He thinks he won the PowerBall. 1.2 Could he be Jebus!? Homsar immediately set his brilliant mind to work solving many of the problems that has plagued civilization for years. He worked with J. A. R. Newlands to create the first periodic table of elements. He is also credited with the discovery of Fullerenes, also called Buckey Balls (Homsar was quoted as saying, upon the discovery of fullerenes, "aAAaaAAaaAAaa lost Buckey's baseball bat.") He also had an element named after himself, Homsarium, which promptly spontaneously combusted killing everyone in its range EXCEPT Homsar, who upon seeing this, commented "oooohno! I think this one's my favorite!" Sadly, though, his scientific career went downhill after the unfortunate shanking of his Jengaship. Homsar entered the 2000 Gravy Train Awards as a last place underdog. But putting his best foot flowered, he caught the attention of Wonder Mike and the hearts of thousands. Moving up in the ranks to fourth place, Homsar was cut out of the competition due to Strong Bad dropping a heavy lourde on him. 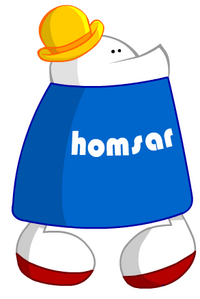 Homsar returned in 2001, to sweep the Captainship of the Gravy Train with his hit Song, 'Song From the Sixties'. He attributes his success to being raised by a cup of coffee. Reported to be the pride of peaches. Hanging from the side of a cliff with The King of Town Dead (?) at the bottom of the cliff with that The King of Town and two lunches. Being an active member of L.U.R.N. Wailing constantly while spinning rapidly from air to ground. This page was last edited on 11 September 2012, at 04:10.